Magic Brownie for sale. Buy online at Zingerman's Mail Order. Gourmet Gifts. Food Gifts. Big, fat, dense brownies, by the piece. Almost a quarter pound each. Dense, cakey, loaded with chocolate. Stuff a couple in your drawer for late afternoon pick me ups and inter-office bribes. Each brownie is packed individually, plainly for protection, not as part of a gift box. 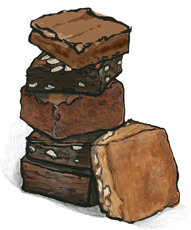 If you’d like a nicely presented cartoon gift box of assorted brownies, click here. The original. Soft, chocolatey, chewy interior dotted with toasted walnuts and covered with a thin chocolate crust. USA Today raved about them. So will you. Worth noting that Magic Brownies are more cake like than moist and fudgy. Same great brownie as the original—without nuts. Pecan praline in a butterscotch (no-chocolate) brownie, topped with sea salt. A big hit with caramel fans. Two layers of Black Magic brownie sandwich a decadent layer of luscious dulce de leche milk caramel. Topped with burnt sugar. The sweetest, softest, richest of all brownies, gooey like a fudgy brownie. Gluten free, made with quinoa and amaranth, stuffed with chocolate chunks. With a texture that's more fudge-y than cake-y you can give it to a standard brownie fan and they may not even miss the wheat. Note that while the ingredients of the brownie itself are wheat free, it is made at Zingerman's Bakehouse where we use wheat flour in other products.